South Korea's beer exports to China more than doubled in 2017 from the previous year, but exports of other alcohol dropped steeply, industry data showed. 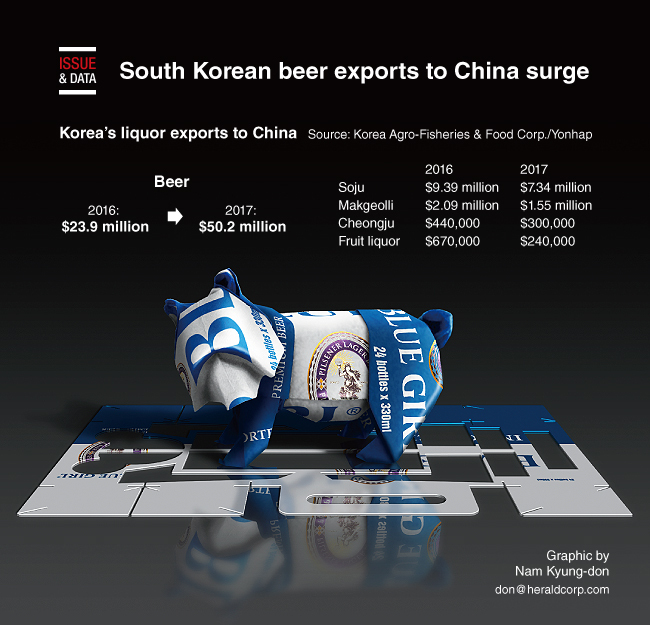 South Korea shipped $50.2 million worth of beer to China in 2017, more than twice as much as $23.9 million tallied in the preceding year, figures provided by the Korea Agro-Fisheries & Food Corp. showed. The volume of exports, likewise, rose to 65.03 million liters from 31.61 million liters, and the unit price of the exports edged up to $0.77 per liter from $0.76. Unlike the success of beer, exports of soju distilled liquor dropped from $9.39 million to $7.34 million in the corresponding years. Exports of makgeolli, a type of rice wine, also declined, falling from $2.09 million to $1.55 million.